There are a number of vision correction treatments on offer from Advanced Vision Care. From laser eye surgery to implantable contact lenses – to find out what you need it is imperative that you understand the treatments available. As this is the case, here we provide you with our treatment ready reckoner so that you can understand what is on offer at our Harley Street clinic. This process is by far the most common laser eye surgery used worldwide today. LASIK, or Laser Assisted in Situ Keratomileusis eye surgery, requires no incision and is completely painless. 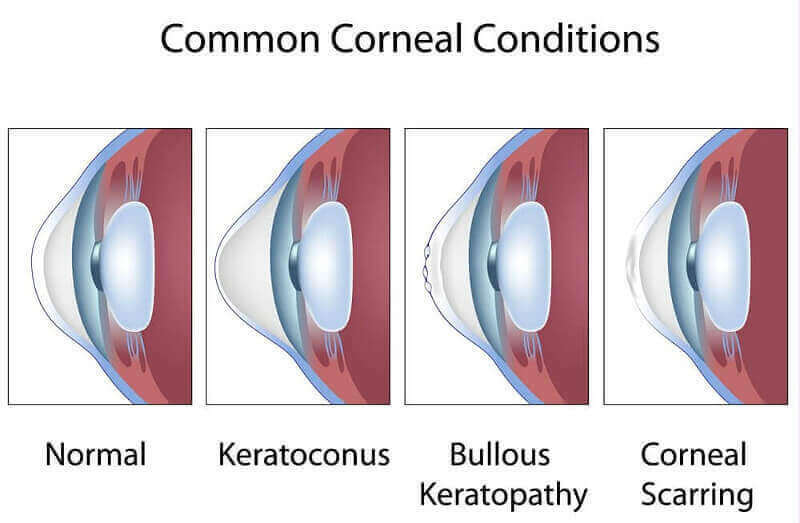 Keratoconus – Patients with a corneal thickness. If your prescription does not allow for LASIK surgery, then it is possible that you may be suitable for LASEK (Laser-Assisted Sub-Epithelial Keratectomy). Alongside LASIK, LASEK is the second most common laser eye surgery type. The difference between LASIK and LASEK is that LASEK is only generally recommended for those who have slightly thinner corneas or an irregular cornea shape. Patient suitability and Contraindications – The only real differences between the patient suitability and contraindications for LASEK when compared to LASIK above are the corneal thickness and patients’ pre-operative prescription. Implantable contact lenses (ICL) are the most common type of non-laser eye treatment because it is highly effective and a very simple procedure that requires no injections or stitches. Performed on one eye at a time in two separate appointments, the ICL procedure takes roughly 30 minutes per eye. Over half a million procedures have been carried out worldwide, and ICL is the current choice of vision correction for the US army. Instead of editing the cornea to improve your vision, Lens Replacement replaces the lens with an artificial one that has been designed depending on your needs. Without a natural lens, patients have no chance of developing cataracts in the future. Therefore, this may be the most suitable option for those with early stage cataracts. This is something you should talk about with your specialist. If you have been diagnosed with the degenerative disorder Keratoconus, then corneal collagen cross-linking could be the answer. Previously, the only option was a corneal transplant, but now this non-surgical procedure, which requires no stitches or incisions, may offer a more suitable solution. This procedure used riboflavin drops on the cornea and exposure to UV light to strengthen the cornea. INTACS surgery involves tiny, micro-thin inserts being placed into the mid layer of the cornea. These inserts flatten the cornea and edit the shape to improve or eliminate Keratoconus. This surgery can be combined with ICL (implantable contact lens) surgery to improve vision further should there be the need. Piggy-back Intraocular Lenses – a non-laser eye surgery – is one of the newest, ground-breaking procedures for those with extreme long or short sightedness. By inserting two different types of lenses – one inside and one in-front – even the longest or shortest sighted individual can see improvements. If you have any questions about the contraindications, make sure you contact us. There are often two types of contraindications; definite and indefinite. Above, we have listed the definite contraindications. However, if you have indefinite contraindications, you may still be eligible for surgery. With several treatments available, our expert team tailor your treatment plan to suit you. With no ties to specific laser companies, we choose what is best for you.